Sydney Roosters Dylan Napa could be plaiyng in his first State of Origin match for Queensland in round 1. 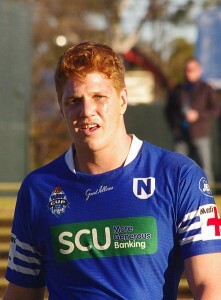 The Roosters giant (pictured) has been picked as 18th man in Mal Meninga’s Queensland squad, but an injured Daly Cherry-Evans could see Napa taking his place on the field. Queensland Coach Meninga said he would very much consider giving the 22-year-old some field time in the first game of the series next Wednesday. “You’ve seen how big [Napa] is and how enthusiastic he is and he’s playing really good footy,” Meninga said. Brisbane born and bred, Napa said he’d set his sites on Origin at the beginning of the season and was keen to be unleashed onto the field at some stage in the series. “It was a goal, to push for a spot in the squad. This is one step closer,” Napa said. Napa has played more than 40 games for the Sydney Roosters, including their grand final victory in 2013. Although the goal was always in sight, the young Rooster said it felt surreal to be amongst so many iconic players. “It’s pretty crazy to be amongst so many iconic players in the league – Greg Inglis, Billy Slater, Johnathan Thurston – it’s pretty surreal,” Napa said. Queensland will take on New South Wales on Wednesday at ANZ Stadium in Game 1 of the 2015 series.